If you are visiting Morocco, we can highly recommend to take a desert trip towards the Sahara desert! We took the three day desert trip to Merzouga from Marrakesh. Do not book the trip online but book it when you are in Morocco. There are a lot of registered tour agencies were you can negotiate about the price. We managed to join a group tour (14-16 people) for 600 dirham per person. If you want a private tour prices are higher, but you can still negotiate a bit about the price. 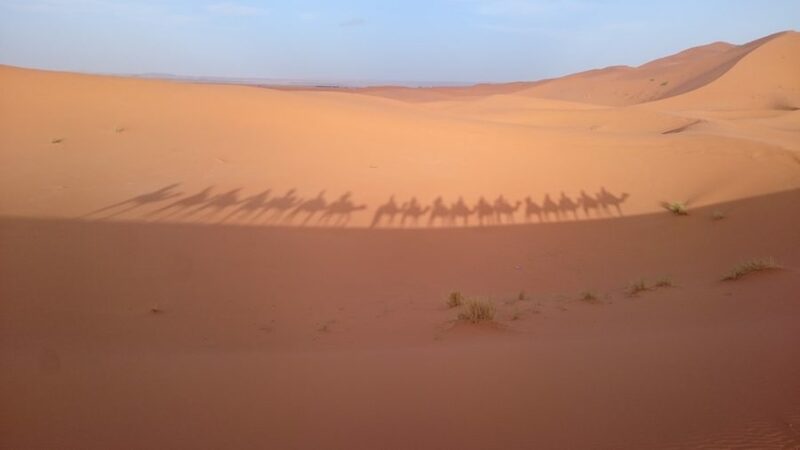 We took the three days two nights trip, but there is also a two day one night trip to the Zagora desert. What can you expect from the trip? We got picked up at 7:00 A.M. near the Medina square in Marrakesh where all the tourists were gathered to get into the tour buses. At 8:00 A.M. we started with our journey, which began with cruising through the atlas mountains. You will see amazing sightings all around you! We stopped at the Unesco world heritage site of Ait Ben Haddou, the fortified village which is along the former caravan route between Marrakech and the Sahara desert. There are still four families living in the fortress, nomadic people called Berbers are the inhabitants. We got a guided tour through the fortress by one of the Berbers, he explained us about the past and the present. A lot of famous movies and series have been shot on the site, including Game of Thrones, Marco Polo, The Mummy, Gladiator and Prince of Persia. The berbers also showed how they weaved carpets, and for a good price you can buy different sizes of carpets from them! And you can also pay with card! (extra 50 dirham fee). The tour passed through the valley of roses, but since it was October there were not any roses blooming. After a lunch in Ouarzazate (the gateway to the desert) we stopped at a vegetable and spices garden. Accompanied by a guide (we did not have to pay him any ‘tips’, guide was included in our trip) we walked through the Dades Valey. After passing Dades Gorges, a mountain passage with astonishing rock walls everywhere you look, we stopped at our first hotel near the Dades Valey. After a Tajin everyone went to bed early after a long day of driving, tomorrow we would leave at 7:30 AM to finally arrive at the Sahara dessert! After an hideous night, the hotel bed had bugs in it and the mattress was unbearable, we woke up early to finally head towards our purpose of this trip: the Sahara desert! After packing all the stuff we needed for the night and another sweet breakfast and off we went to the desert! A short stop for lunch before we reached the outskirts of the desert, sand and rocks everywhere! Just outside of the sand dunes we stopped at an old ruin where we met our three guides, Berbers who live in the area. These three Berbers would accompany us to the base camp in the desert. After we left our backpacks in the bus together with our driver, we put on our scarfs desert style and headed to our new way of transport: camels! With two groups of a total of 16 people one by one we were guided to our camels. And yes, at first it is really weird to sit on these animals. The Berbers guided us for one and a half hour passing through the the beautiful sand dunes. You can see the sand going from a greenish color becoming the famous red sand. And all of this while there was a spectacular sunset in the mix, just perfect. Finally, we reached the base camp. The base camp consists off a few wooden cabins with matrasses in it, a big carpet in the middle with tables and an outback toilet with no running water (flushing by hand) and, no WiFi. Really making you one with nature! The sunset was still on a perfect level and there was a big sand dune next to the camp, so we decided to climb up for an amazing view. The climb up was tough, walking up the sand while also getting all the sand in all of your clothes. But, it is worth the climb. Watching the sunset on the top of the dune and seeing the clear sky at night coming out is too beautiful for words. After a slide back to the base camp and freshen up with wet towels (tip: bring a lot of these, they refresh you since you will not be able to take a shower) the whole group gathered in the middle of the camp for dinner. You guessed it right, Tajine! Chicken or vegetarian and a lot of Berber Whisky (you might think alright, some nice scotch! But hold your horses, Berbers do not drink alcohol. Berber Whisky is how they call their sweet tea). After the delicious meal the Berbers treated us with their local songs. All of them singing and the usage of small drums. They also gave us some speed classes how to use the drums. After 10:00 PM we hit the sack, early in the morning we would go for our camel ride back to the ruins and stopping over for the sunrise. At 5:00 AM we got up. Why so early you ask? Because of the clear sky you can gaze upon. Because there is no unnatural light in the area, you can see the sky perfectly. All the stars shine bright, with falling stars surrounding you. It is breathtaking. At 6:30 AM we got back on our camels, after 40 minutes of camel ride we got to the other side of the dune next to our base camp to see the sunrise. A perfect view of how the sun took back control and gave the red sand some extra light again. After enjoying that spectacle, we got back on the camels for another 50 minutes to the ruins where our driver was waiting for us to drive 8+ hours back to Marrakesh (wear some comfy clothes because you will be filled with sand, not able to take a shower). After a few small stops for food we got back at night in the city. What extra costs can you expect? Inform well which guided tours are included in the trip, most of the trips are. For some you have to give a mandatory tip. Breakfast and dinner for the first two nights were included, lunch is from your own money. The tour usually stops near expensive places, but sometimes you can find some street food as well in the area. All by all I can highly recommend going to the Merzouga desert. There are also day tours available from Marrakesh, but they do not take you to the Sahara desert. And if you fancy, you can even take tours for 4 or 5 days. Of course private tours are an option as well, you can make it as expensive and exclusive as you want. To read more about my trip to Marrakesh, check out my other blog: Places to visit in Marrakesh: colourful chaos of Morocco. Thank you for the kind words! Yes, you guys should definitely visit 🙂 ! Love this post! Great pics and such an inspiring destination 🙂 Tweeted it! If you ever need any tips setting it up, feel free to contact us! 🙂 Cheers! Thank you so much for the nice words! We will do our best to keep you interested :)! Thank you so much Olinda!